Everything looks better on a ceramic plate, no? I used to think all things with tentacles were huge, and that calamari rings were hollow tentacles. So it definitely threw me off when I'd pick up the little tentacle bundles that like to splay out like a bloomed flower. 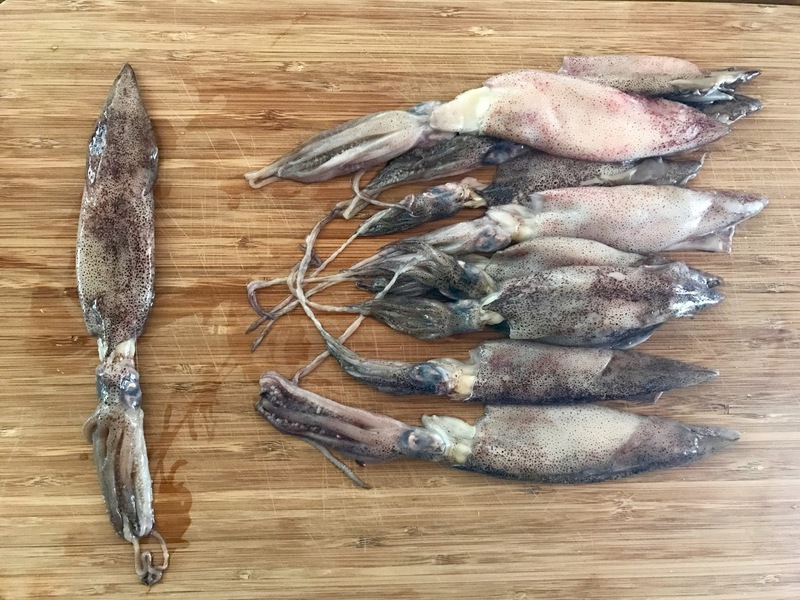 A little infant squid got into the catch of adults, I supposed. 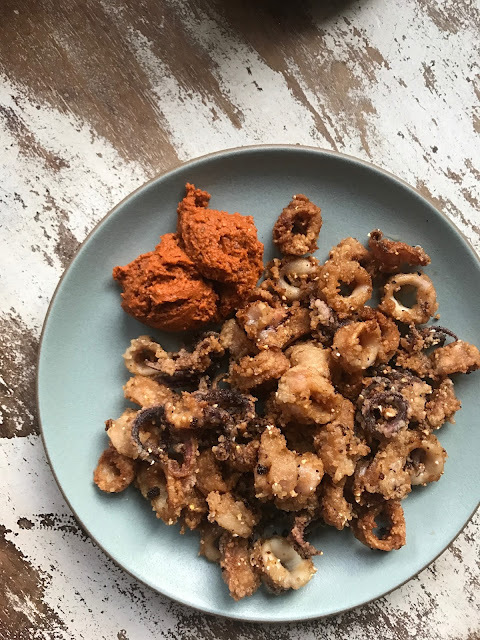 I'm not entirely sure when that childhood idea was amended, but I do know that I couldn't get calamari with romesco sauce out of my head after seeing it on a lunch menu at a restaurant I did not end up going to. So after work, I promptly rushed to the infamous Berkeley Bowl for the first time to pick up a pound of squids (and oxtail, but that's another post). Definitely needed to consult Youtube to figure out just how to clean and prep a pile of squid for calamari. The end result is a lot of guts, and if you know what you're doing, maybe a little pot of ink. But I clearly didn't really know what I was doing. 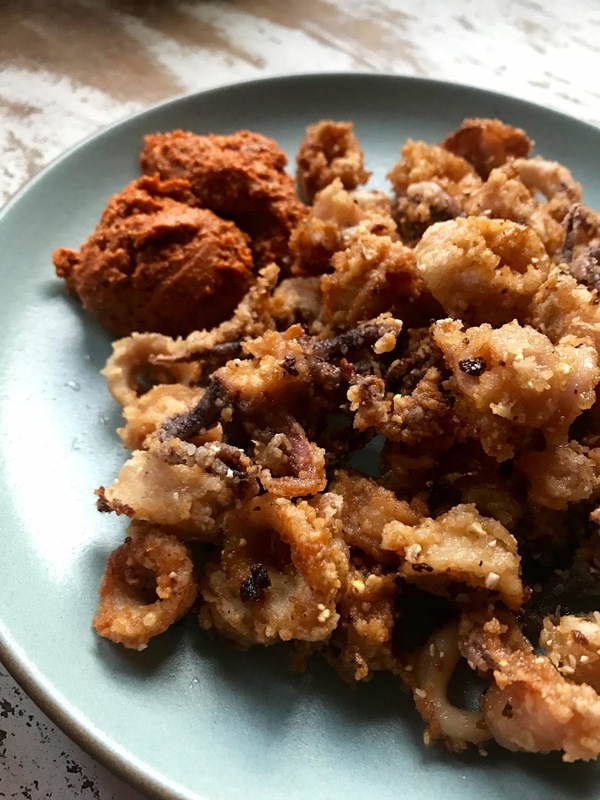 I did end up with a pretty plate of panko and cornmeal crusted calamari with walnut romesco sauce. Probably as good as the restaurant. I'm going to say definitely as good. Because it took me hours to make and only minutes to devour. And that's because I was trying to pair a little ring with a little spread of sauce. And to think this fancy appetizer would've never been at fancy (and sometimes non-fancy) restaurants here if it weren't for an over fishing problem in NY. And just because calamari is the Italian word for squid, I'm gonna throw in this heaping plate of tortellini with meat sauce from Italian Homemade Company where there are piles of fresh pasta in the window and the hostess is beautiful and speaks Italian. Meat sauce was a kind of bland, but the salty tortellini filling balanced that out like a nice accident.